What is a Divided Exam Room? 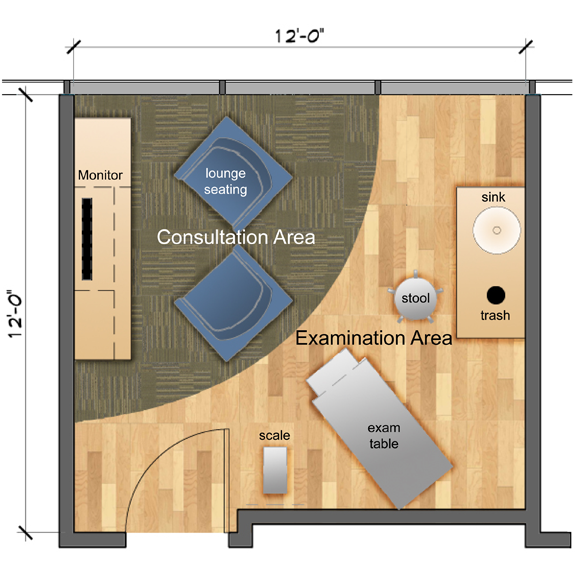 A divided exam room is a variation of the standard medical exam room that is drawing interest in clinic space planning. This design model is appropriate for medical practices that choose to provide concierge care in which patients (sometimes called members) pay an annual fee for the opportunity to have easier access to a physician and longer appointments with a wellness focus. It is also ideal for integrative medicine practices where more time is spent with each patient discussing lifestyle modifications. Actually, Mayo Clinic was the first to initiate a combined consult/exam room referred to as a “Mayo room” many years ago. This multi-use space has all the features of a traditional exam room and also includes an area for consultation, counseling, and education. A divided exam room may be a multi-room suite or condensed into a single room with dual-use for examinations and consultation. The most basic divided exam room is simply a larger than average exam room divided into areas by use. One side of the room will contain the exam table, diagnostic equipment, sink, storage cabinets and clinical supplies while the other side is designed for comfort and to facilitate discussion. The consultation space may consist of two lounge chairs in front of a large monitor or simply a table with comfortable guest chairs for the patient and physician to sit and talk. The consultation space should be comfortable and inviting. The seating should be arranged to promote communication between the patient and physician. The monitor may be used to review medical records, educational material, or to display stress-reducing nature images. The consultation area may also include a wardrobe, display shelves, art, magazines and diagnostic equipment. The design team may choose to make the consultation area visually different through use of materials to reinforce the purpose of the space. If space allows, an exam room and consultation area can be divided into two rooms, separated by a door, offering the patient a more relaxing environment to encourage discussion. 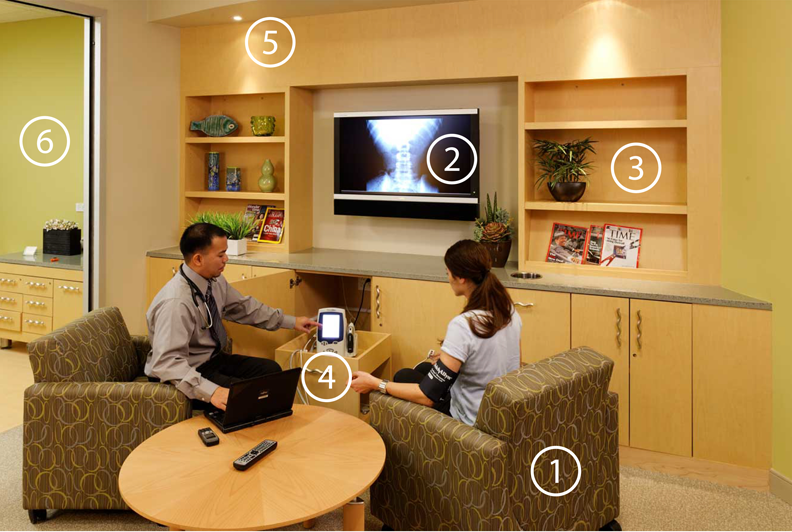 In this configuration the patient waits in a private consultation room with access to a TV monitor with educational programming, music, reading material and wireless Internet. The healthcare provider sits side-by-side with the patient in comfortable lounge chairs facing a wall-hung monitor to review lab reports, radiographs and to view medical images or videos if necessary. Vital signs are documented in this room and electronically uploaded to the patient’s health record. Once the consultation ends the exam continues in the adjacent exam room. This configuration also includes a private toilet and designated nurse station. 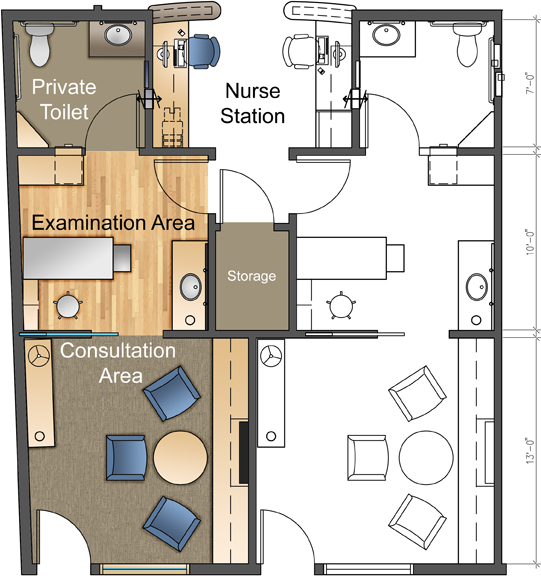 Multi-room Exam Suite Floor Plan. 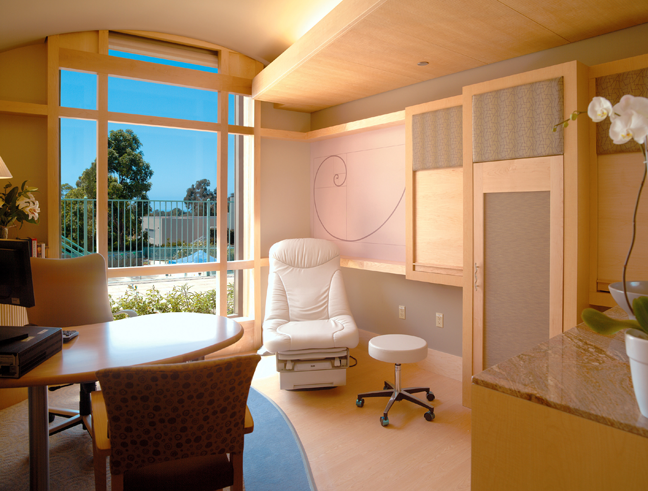 Designed by Jain Malkin Inc.
Consultation Room at Cisco LifeConnections Health Center, San Jose, CA. Designed by Jain Malkin Inc. Designing a suite-style exam room can be beneficial in many ways but may not be the answer for every clinic. Perceived wait time may be reduced. The consultation space is private and comfortable with a variety of positive distractions offered to the patient to reduce stress. They can watch TV, research medical questions, work on their laptops or flip through a magazine without distraction from other patients. In the dual-room model the consultation space is self-contained accommodating spouses, elderly parents or children comfortably. Some clinics are even providing Xbox or PS-3 so the kids (or dads) can keep themselves entertained. Space is usually at a premium. The most obvious draw-back to the suite design is that it takes up a lot more space. A traditional exam room is 8’x12’ or 10’x12’ while an exam care suite may be 12’x12’ or 12’x30’ if a true two-room suite is created. This concept essentially creates a private waiting room for each exam. Seeing more patients in less time is the goal in our current healthcare system as reimbursement keeps spiraling downward but when physicians are incentivized to keep people healthy and focus on prevention, longer appointments in a dual-use exam room makes sense. Scripps Center for Integrative Medicine, La Jolla, CA. Designed by Jain Malkin Inc.